As Consumer Cellular targets the seniors' cell phone market, here we are going to talk about the Consumer Cellular phones for seniors. Consumer Cellular doesn’t have a wide cell phone selection when compared to the major cell phone providers Verizon, AT&T, T-Mobile, and Sprint. This company offers phones from the basic phones to the Android and iPhone devices. If you are looking for senior friendly phones, designed with seniors in mind; Consumer Cellular is one of your fewest choices, it offers basic and simplified smartphones with many senior-friendly features. Let’s preview the Consumer Cellular phones for seniors showing their features, prices, the Easypay service offered by Consumer Cellular, and Consumer Cellular plans. Consumer Cellular used to provide the Doro cell phones, which is a Swedish cell phone manufacture that specialized in the senior cell phones. The Doro phones are easy-to-use, amplified, compatible with hearing aids handsets that have emergency buttons, and have affordable prices. The latest Doro cell phones offered by Consumer Cellular is the Doro PhoneEasy 626 and as the number of senior citizens using smartphones increased it recently offers a Doro simplified smartphone for seniors, which is the Doro 824 SmartEasy. The Doro 824 SmartEasy is the second option of the Consumer Cellular phones for seniors. It were a simplified Android smartphone and considered one of the best smartphones for seniors. The phone comes with 5 inches touchscreen and is loaded with a simplified user interface that ensures the ease of use. The Doro 824 SmartEasy has adjustable amplified volume setting, emergency alert button to call for help when needed, and a pre-installed Manger App; which is a step by step guide to learn how to use the phone. 8MP primary rear camera, 2.0MP front-facing camera. Supports Wi-Fi, GPS, Bluetooth, and built-in FM Radio. Consumer Cellular offers the Doro 824 SmartEasy for $200 and any monthly plan from Consumer Cellular; which will be discussed below, which offers the data plans as separated plans; you can add any of the data plans if you need. 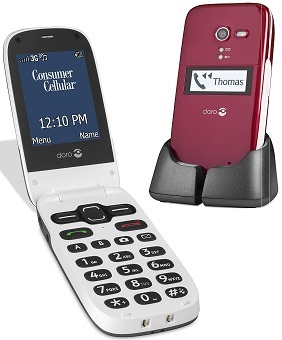 The Doro PhoneEasy 626 is one of the Consumer Cellular phones for seniors that is specially designed flip cell phone for seniors and allows you to answer with a simple flip. As a senior friendly phone it comes with big buttons that have large numbers, the display screen has easy-to-read fonts, amplified sound and is hearing aid compatible. For added peace of mind, it has an emergency alert button. A colorful screen displays big fonts. Bluetooth, basic Camera with flash, Supports up to 32 GB Micro SD card, Flashlight, FM Radio. 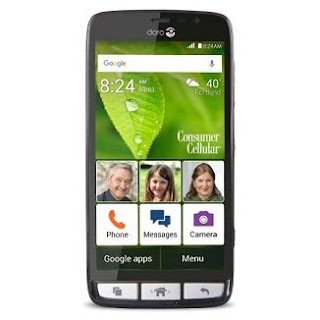 Consumer Cellular offers the Doro phoneEasy 626 for $50 and any monthly plan from Consumer Cellular. Consumer Cellular offers cheap no-contract cell phone plans for seniors. The talk plans start as low as $10 per month. Pay as you go plan for $10 per month and $0.25/each minute. You can buy the expensive Consumer Cellular cell phones for seniors including the Doro 824 SmartEasy starting from $50 with the Easypay service, which is a scheduled monthly payment service.